The Rupes BigFoot Polisher Bag proudly displays the Rupes logo while protecting your Rupes polishers and other detailing products! The bag is constructed of ultra-rugged, water-resistant nylon canvas that is built to last. Reinforced seams are on every corner of this bag, while the shoulder strap is attached with metal anchors. This allows for the utmost durability and longevity of this bag. The inside of the Rupes BigFoot Polisher Bag has eight pockets for your polishes and compounds. There are four pockets for 8oz bottles, four pockets for 16oz bottles, and dedicated pockets for holding pads and other accessories you may have. These pockets and the straps that hold your buffer in place, allow everything to stay neat and in place during transit. Pick up the Rupes BigFoot Polisher Bag today to safely and easily carry your detailing products! 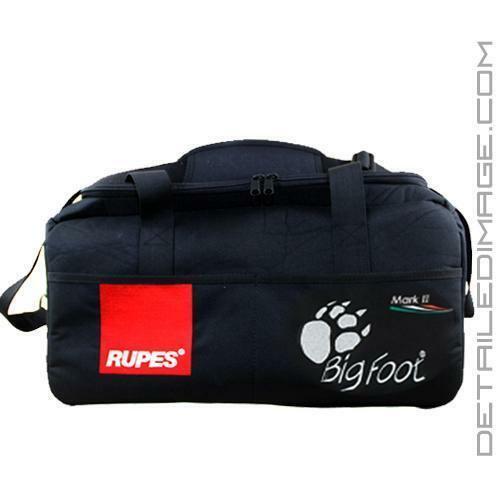 Universal - Features Rupes and BigFoot logo on the front of the bag. Mark II - Features Rupes, BigFoot and small Mark II logo on the front of the bag. This is an amazing bag. Having something designed specifically to carry and organize your detailing products and tools will not only look professional, but increase your efficiency and quality of life not having to search for products. This bag is a fantastic addition to any detailer. It is large enough to fit my rupes 21 , rupes lhr75 , towels and scan grip hand held light. All of that plus the 4 16oz and 4 8oz bottles plus space for polishing pads. YES it is that big of a bag. Great quality. I love this bag you won't be disappointed. Quality bag, that is bigger than it looks. Plenty of room to store all your small brushes, tapes and accessories. The only complaint I have is the large compound pockets don't seem to like the large Menzerna bottles. There is a little ridge at the base of them that makes it nearly impossible to squeeze in there. Just got this Rupes bag for Christmas and must say it is much stronger than I expected. All the stitching is done nicely with no strays, including the logos. It has plenty of slots inside for all your waxes, polishes, compounds and has a center strap to hold your buffer. A definite step up from one I bought years ago and a great upgrade.